Ready for a quick motivation tip to give you an instant feel-good vibe? I’m thinking specifically about those who hate studying, ’cause I know you need a boost! 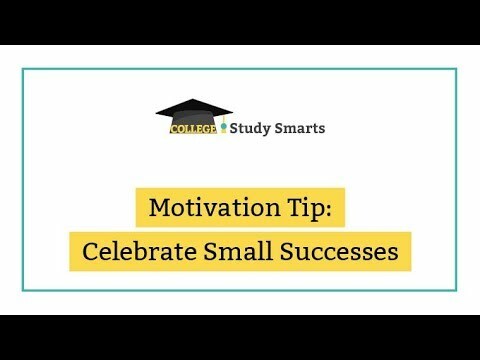 Start to celebrate your small successes. If you’re mentally tuning out, stick with me for one more minute while I convince you this strategy helps you do better in school. Is it no wonder inner motivation is hard to come by with thought patterns like this? Don’t worry if you can relate, I have a quick motivation tip to help flip this pattern around. Today’s motivation tip is actually rooted in positive psychology. Not only does celebrating our successes feel good, but it sets us up for future success. The practice of noticing and celebrating what we do well helps the brain to rewire itself to look for the good things, which ultimately leads to more success. Dig positive psychology like I do? Check out this article about how celebrating small wins can lead to bigger wins. I started thinking about this idea because an article I wrote was recently accepted as a guest post on Time Management Ninja (check it out here). You might be reading this blog full of my words and feel like my guest post isn’t a big deal…BUT IT IS! I’ve never thought of myself as a writer, and definitely not a good one. One of my personal goals this year was to submit articles to a handful of websites I follow and try to be a guest blogger. Part of my strategy was to make a series of tiny goals I could complete. You know I like to start small with habits, and I approached this goal the same way. Each time I completed one of my tiny goals I wrote it down on the calendar to mark my success. It is proof I am honoring my commitment to myself and making progress even if I don’t see results right away. We never see results right away. There is no perfect answer here. Whatever commitment you make to yourself, like these ideas, pause and make a note when you follow-through on these commitments to yourself. Write it on your calendar — Makes it easy to look back and see your accomplishments add up over time. Also helps to get a realistic picture of how long something takes. For example, I submitted my guest post and it took 3 weeks for it to be accepted, edited, and published. That helps me remember next time to be patient (and honestly this went faster than expected). Email a friend. — Allow someone else share in your excitement. You get to share the pride and confidence with someone else, and you might just encourage them to keep making progress as well. Not sure who to email? Send me a note! I LOVE to celebrate successes with my tribe of students. Perform a monthly review. — Identify some things to track each month (examples: days you studied, minutes of study time per day, assignments submitted, grades earned) and keep a spreadsheet so you can see your growth over time. I find this extremely helpful when starting out with a big goal. Tiny commitments DO add up over time. Need some extra motivation tips? Check out the free 7-day study challenge. You’ll get daily emails with motivation to get you started on new study habits or help boost your existing habits. What is your small success this week? Take 5 minutes today to reflect on the past week. List out three things you did awesomely. You can totally come up with three small successes! Write them down so you can keep track of them.